For more than 100 years, the Branson/Lakes Area has been attracting visitors to the Ozarks, lured by natural beauty and outdoor recreational activities. With dozens of glittering music halls featuring regular live-music spectacles, Branson rivals Nashville as a country-music mecca. The heart of the Ozark city’s entertainment industry lies along Route 76, which is already crowded with miniature-golf courses, bumper-car concessions, souvenir and hillbilly-crafts shops, motels, and resorts. If you prefer the great outdoors, Branson offers many options. Within minutes of downtown you will find bass and trout fishing and all the other water activities on one of three pristine lakes, hiking, biking, horseback riding, picnics, geocaching, and camping in many privately owned campgrounds and RV parks and the nearby 1.5 million acre Mark Twain National Forest. There is also the Silver Dollar City and Celebration City amusement parks are popular among many other similar types of attractions. Branson is within a day’s drive for nearly half of America’s population accounting for 80% of the people driving their cars there. (Branson is one of the Top Three RV destinations in America and 5% come in buses.) Now with a brand new local airport, two major airlines service the area making the area even easier to access. 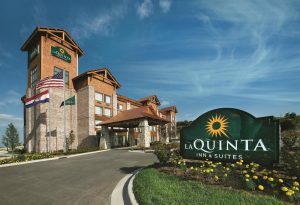 La Quinta Inn & Suites Branson – Hollister is literally across the White River/Lake Taneycomo from Branson, while the airport is directly South of our property. You will find plenty to do in the Branson/Hollister area. And you can head down to Eureka Springs, Arkansas, where the entire downtown is listed on the National Register of Historic Places. 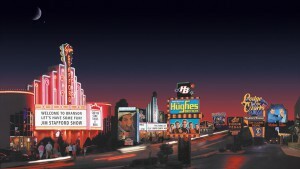 Whether you want to see Andy Williams or the Acrobats of China, music or comedy or, with Ray Stevens, both, you will not run out of entertainment in neighboring Branson. 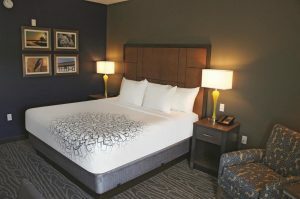 After filling your days and evenings with Branson’s entertainment, you can retire to the quieter side of the White River, enjoy some good local restaurants, and relax in your incredibly comfortable room at the La Quinta Inn & Suites Hollister. After a great Free Bright Side Breakfast™ the next morning, you will be ready to do it all over again! 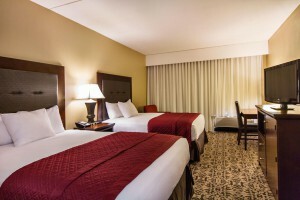 Visitors will love the spacious rooms and comfortable pillow-top beds. Rooms also come with a mini-fridge, a microwave, complementary Wi-Fi, 32” flat screen TV with cable, a coffee maker, a hair dryer, an iron and ironing board, and complementary local calls. Also available are a fitness center on site, a guest laundry, and a Sundry Shop for guests. If you are in town for business, they have a meeting room that seats up to 47 and a business center. 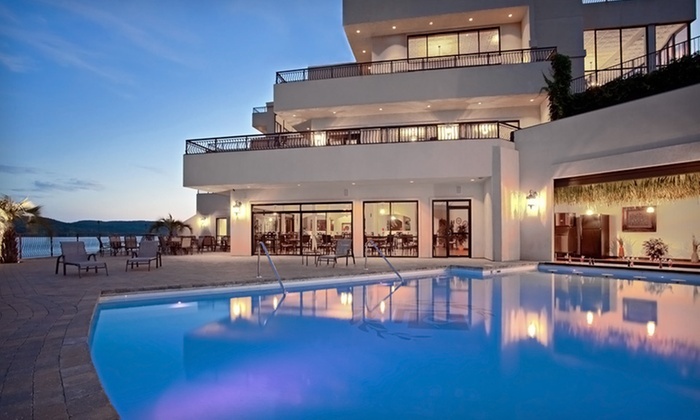 Enjoy the indoor heated pool and whirlpool all year round. As one of Branson’s premiere hotels, the Grand Oaks Hotel stands apart with its luxurious accommodations, dedication to customer service, and attention to every detail of your stay. Here at Grand Oaks, you will enjoy a refreshing environment, quality amenities, and a level of service traditionally associated with “upscale” hotels, all at an incredibly affordable price. We are located just minutes from some of the best attractions, shows, and restaurants that Branson has to offer, making it easy for you to maximize your day, and return home to enjoy your night. At the Grand Oaks Hotel, their friendly and professional staff is ready to assist you with any question or need that you may have during your stay. 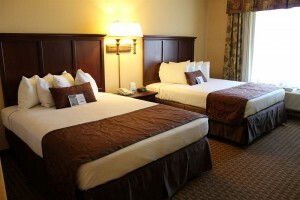 They are committed to delivering high quality service, stylish and comfortable accommodations, and Ozark hospitality. The Grand Plaza Hotel and Conference Center is a full service conference center hotel located in the heart of Branson Missouri just off the world famous Highway 76 Country Music Boulevard. Within walking distance to some of Branson’s biggest shows and attractions as well as some of the greatest outlet shopping. Upscale accommodations offering 200 rooms. Enjoy an extended hot complimentary breakfast buffet to start your day out right. 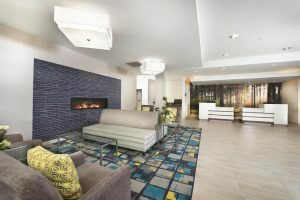 Enjoy a wealth of amenities which include indoor pool, spa, fitness center, game room, guest laundry, complimentary Wi-Fi, gift shop & 24 hour business center. Visit the ticket/concierge service for help with show reservations, attraction tickets or local transportation needs. For your convenience refrigerators are located in each room. The Plaza View Restaurant offers a variety of fine cuisine and a spectacular view of the Ozark Mountains to the North or the Strip to the South. Specialties include our Succulent, Slow-Cooked, Mouth-Watering Prime Rib and Delicious hand breaded cooked fresh to order Catfish. Pub on the Plaza is known for a relaxed atmosphere, with yet an exciting vibe. Enjoy an evening cocktail, or your favorite spirit along with scrumptious appetizers. The breathtaking Ozarks provide the backdrop for The Cabins at Green Mountain and the resort’s luxurious two and three-bedroom vacation villas are situated in the heart of Branson, Missouri. The property is canopied by age-old cedars, maples and grandfather oaks, allowing a reconnection with nature. Each cabin features a fireplace, full kitchen, and washer and dryer, making this your home away from home. Spend your days relaxing by the pool, boating on one of the nearby lakes or teeing off at one of nine area golf courses. Step back into the 19th century at Silver Dollar City and hit the outlet stores on the way back to the resort. When the sun goes down, take in a show at one of more than 45 theaters throughout the town. Whether your musical tastes lean toward jazz, gospel, Broadway, country or somewhere in between, you’re sure to find a show you’ll love in Branson. The luxurious accommodations at D’Monaco are truly heaven on earth! The choices are unique none of the villas are alike. 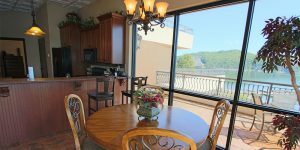 The exquisitely furnished living room opens up to your private verandah over looking beautiful Table Rock Lake. The kitchens are state of the art and fully equipped. All of the bedrooms are master suites with king size beds, for a blissful night’s rest, and your very own personal and beautifully appointed bathroom, with a beautiful walk in shower, and televisions in every bedroom. Step out at the end of the day or early in the morning on your private verandah and take in the awesome views that surround D’Monaco. Beautiful mountains, flocks of geese, fish jumping, a Blue Herron on the dock, watching the water intently for his next catch of the day! Mother Nature provides a wonderful show. The grounds of D’Monaco are spacious and landscaped beautifully totally secured from the world and the gated property assures you of the utmost privacy.